Easy to make pie that combines chocolate and vanilla in a smooth, creamy filling that goes so well with the graham cracker crust. Over medium heat, whisk together the two puddings in a medium saucepan. Add in the milk and whisk often until the pudding come to a slow boil. Remove from the heat and add the sour cream. 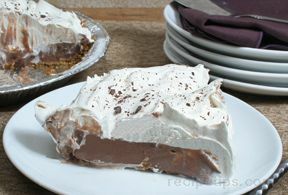 Pour into the prepared graham cracker crust and place in the refrigerator to allow it to set up, approximately 3 hours. Top with a non dairy whipped topping or whipped cream. Sprinkle with chocolate shavings for garnish.